Introducing our newest collection of Printed Kid's Blankets featuring the artwork of our in-house illustrator Sylvia Pacheco. Our whimsical Kid's blankets are available in three sizes: 28" x 38," 38" x 56," and 50" x 70." The original artwork is sublimated on to our softest Luster Loft Cotton Ball fabric for a unique blanket sure to be treasured forever. 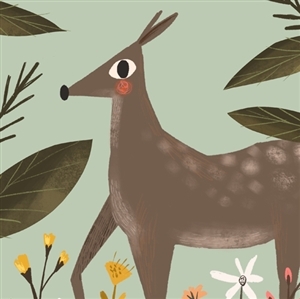 This super soft and cozy blanket features a magical deer pausing for a moment in a flowery meadow. This super soft and cozy blanket features a curious fox on a trot in the woods. This super soft and cozy blanket features a sweet bluejay resting on a winter branch. This blanket brings a touch of whimsy with an elusive sleepy unicorn making a wish as the feature of this cozy blanket. This blanket, printed on our Luster Loft Fabric in Cottonball features a bunch of bunnies frolicking through a flowery field. This super soft and cozy blanket features a sweet frog prince resting for a moment on a lily pad.